What WordPress Plugins should you use? That is a question that clients often ask and the answer is IT DEPENDS. Yes, I know that isn't at all helpful. The next question that clients often ask is "What WordPress Plugins are you using?" That is a question that can easily be answered. Below, is a list of the plugins that are currently running on this blog. This is the plugin that I use to set a custom 404 page for my blog. http://iteachblogging.com/custom-404-pages/ This makes life so much easier because no coding is needed. It works with just about every theme out there but you will want to test it. Keep in mind some themes such as Thesis Theme have this built into the theme. Before you install this plugin do check your theme to see if there is an option. A while back I did a content audit on my blog and in the process I deleted some blog posts and merged some blog posts. So when I delete a page, I can set a 410 notice for that page and tell Google that the page no longer exists and that it isn't an error. Now there is some debate as to whether or not this is still needed in today's Google but I am a better safe than sorry gal. This is the standard spam checker that is installed and active on over 1 million WordPress blogs. After all, it is created by the creators of WordPress itself. Therefore, you can trust it to be a great product and that it is. If you want to stop comment spam on your blog activate and set this up today. You will need to go through a few steps to get your API key. Note that they do ask for donations but that is purely up to you. As a general rule you will want to have a contact form on your website. It just makes communication with your potential clients so much easier. There are quite a few WordPress contact forms to choose from but this one has served us well year after year. CoSchedule is a premium plugin, which means that it is pay to use but it is my all time favorite blogging tool. Not only is it great for content calendar planning but it is AHmazing for social media scheduling. We use it for scheduling social media promotions for ​old blog posts and for schedule blog posts as well. For example, there are currently 5 blog posts on this site scheduled for the future. When these blog posts release they will automatically be shared on all of the social platforms with images and links back. This handy plugin allows us to assign a profile image to a WordPress user that doesn't have a gravatar image. This is the plugin that we use for guest post authors so that they have a nice image to go with their profile. It just makes life easy. This is the plugin that we use to deliver downloadable pdf documents to our readers. It allows you to easily create a download link that you can embed into a blog post or page on your site. You can also track how many times a document has been downloaded. It is also easy to use. Read here about how to use Download Monitor plugin. This free plugin is how I setup my Facebook pixel. It cuts out all of the complicated code and makes life easy. If you are unsure about the Facebook pixel check out this blog post. This is the plugin that we use connect our Google Analytics account and our WordPress Site. One of the nice features is that we will also get a simple snapshot of our analytics right on your WordPress dashboard. Jetpack is an all around or jack of all trades kind of plugin. It is developed by the folks at WordPress and has many features. We are currently using their analytics feature and Photon feature and a few others. My recommendation is that you spend some time studying all that Jetpack has to offer in comparison with your theme. We use this WordPress plugin to redirect pages to another page. For example, there have been old opt-in pages that are no longer relevant but are ranked on Google. In that instance, we just redirect the page to a more relevant page. This plugin just makes that process easier. This plugin does exactly what it implies. It makes links pretty. So instead of https://www.facebook.com/groups/882597655139193/ which is an ugly link, I used pretty link to create http://iteachblogging.com/mafia. This is a plugin that is extremely popular for affiliate marketers because the affiliate links are really ugly. This plugin with a funky name keeps a sidebar widget fixed on the page. Normally, a sidebar plugin disappears as you scroll down the page but with this you can choose to have it stay in the readers view. Plain and simple, this plugin helps stop spam and hacking. It doesn't completely stop it but makes it slightly easier. It is extremely annoying for the honest reader but a necessary evil in today's digital world. A few WordPress updates back, they got rid of the title field for images. This handy little plugin ads that back and that makes us happy. This blog is hosted with SiteGround and this plugin comes pre-installed. You can remove it but it helps the site run a bit smoother so we keep it around. There are several different WordPress Podcast players out there but this premium one by Pat Flynn is just beautiful. Yes, we do pay for it but it has been well worth it. It is easy to use and it is highly recommended. This is our newest premium plugin and was purchased out of pure frustration but it has put a big smile on this bloggers face. The site runs fast and the social media buttons always work. Also, the the images shared on social media are the ones that were chosen by us and always look great on Twitter. Thrive Theme products are the heart and soul of this blog. This blog is running a Thrive Theme, Thrive Leads and Thrive Content Builder (a.k.a. Thrive Visual Editor). Thrive has developed what we believe to be the best themes on the market. 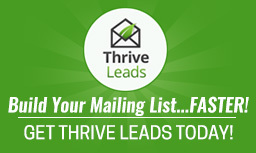 Thrive Leads is what we use for email opt-in forms. Thrive Content Builder how we create landing pages and stylize blog posts. This is the contact form builder that we are currently using to create advanced forms. When we want to ask additional questions of new clients this is the form that we use. This is another plugin that we use for security. This hides our login page. Traditionally we log into WordPress on the /wp-admin page but this allows you to set an entirely new page to login. Do note that you must make a note of the new secret page because if you forget what it is, you will be in trouble. It hides the login page from us all so knowing that url is critical. This is the SEO tool that we use to control the meta title and meta description for our blog posts and pages. We also use this to update our htaccess file instead of logging into the cpanel each time. This live chat plugin has helped us connect with new clients over the years and is a handy way for readers to reach out to us. ​What WordPress Plugin to use greatly depends on the need of your site and that need evolves over time. There is often a great deal of conversation about whether or not a site is running too many plugins but there doesn't seem to be such a thing. It really comes down to whether or not the plugins run well together and is well built. Some plugins get abandoned by the developer and therefore don't get the needed updates. This is why it is critical to pay attention to your plugins and update them as updates come available. However, sometimes when you update a plugin it can conflict with something and crash a site. Yes, it is a pain and frightening but it is the reality of digital life.